Once we accomplished the flooring (which you can see in the post here or head straight to the video here), it was time to start addressing where we are going to store our stuff and prepare for the bus closet construction. If you take a look around your home, you’ll notice something in almost every room. In the kitchen, we call it a pantry, a wardrobe, an armoire… that spot for everything in your house that you want to keep behind a closed door. We’re talking about closets. NOTE: My wife says to mention this is not our closet! 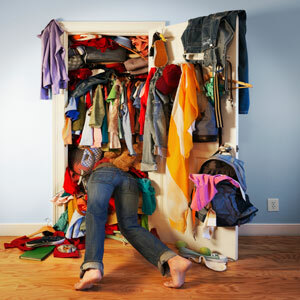 The average American home has 2 more closets on average than they do bedrooms. That means that there is more room for our stuff than there is for the actual human beings who live in our homes. In deciding to make this leap, we realized that the overabundance of closet storage was not going to be a luxury we would be able to accommodate, so it came down to making the most of the closet space we are going to have. You may think we’ve been into the sippin’ whiskey, but we’ve put a lot of thought into this. We can pair down a significant amount of our closet space by taking a utilitarian point-of-view when looking at our textiles and closet going stuff. By eliminating repetitive items (extra towels, pillow-cases, etc) and any one-use clothing we free up a ton of space. Taking inspiration from a certain Swedish flat-pack furniture store, we’re making a cube style modular shelving system, complete with slide-out boxes to organize all our bits and baubles. Taking inspiration from a certain Swedish flat-pack furniture store, we’re making a cube style modular shelving system, complete with slide-out boxes to organize all our bits and baubles. The best part about this project is that we can customize each drawer to fit our stuff specifically. Sized to our things, so nothing can be put away wrong…lol. This will also help to eliminate the sliding and clinking of things together and minimize the risk of breaking all of our Fabergé eggs. The process starts with fastidious measurement of the back cavity where the closet will be built. This is an extremely important and easy to overlook step, but it is vital to make sure you can fit everything as well as you can before you take things into the rig to install them. Obviously, the possibility exists that you won’t get everything right the first time. Okay, so that’s actually pretty likely. Just adjust accordingly and you’ll get by fine. Once we’ve measured everything we can cut down all the pieces to size and start skinning the back cap of the bus so that all the insulation is covered. Just make sure everything is buttoned up and sealed as tight as you can to prevent any air infiltration. Check out the video of the bus closet construction part one of our closet series: No Skeletons in this Closet below. And don’t forget to subscribe and support us on Patreon if you’ve found value in any of our videos. Your support is appreciated and will help us continue on an adventure to educate and inspire! This entry was posted in Bus Conversion, Front Page and tagged bus conversion, eagle model 15, tour bus, wanderlust bus, organic, Eagle 15, Tiny House, skoolie, modular closet, bus closet construction. Bookmark the permalink.